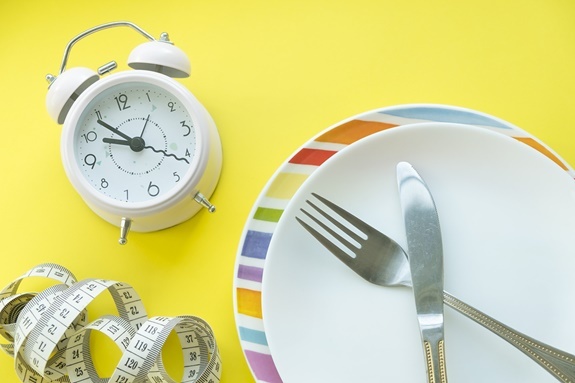 Intermittent fasting is an amazing way to achieve weight loss safely and to keep it off. So here I go again taking on another so called weight loss solution/challenge. But I consider myself a good candidate for the challenge. What makes me the best Guinea pig to try so many trends and methods to lose weight? Because I've got - what I call - the 30 pound struggle. Sure, I put the work in and can lose the weight, but then sometimes I run into periods of time in my life where I let myself go and put it right back on again. Two things that have helped me from becoming obese are that I try to eat as many (if not a little more) healthy foods as - not so healthy foods (if you know what I mean). The second is that I’m always trying many weight loss programs, not only for my own weight loss, but so I can also share the experience. Now that takes me to intermittent fasting, which so far has been one of my best experiences by far, plus fasting is actually healthy for you if done correctly. I can see this method becoming a lifelong life style change for me. So just as the name implies intermittent fasting is just that. There are periods in the day and/or night that we simply do not eat. There are several ways to do this but my choice is the 16/8 method, because for me it is so much easier to do than any of the other suggestions offered. Everyone is different, so hopefully one of these will be appealing for you to try. Means out of your 24 hour day choose 16 consecutive hours to fast. This is my method of choice. I simply eat as usually until around 5:00 or 6:00 p.m. and then I won’t eat till about 9 or 10 the next morning. This 16/8 method works very well, not only for weight loss, but it also gives you extra energy and keeps your digestive system delightfully regular. It really feels nice not always being weighed down by constant snacking which keeps the digestive system working overtime. Not only that, but it’s simple and I can easily manage this routine. It seems to be the least demanding from all the methods that are offered. This method means that during the week you eat normally for 5 days but fast the other 2 days. It is recommended that men can eat 600 calories and women 500 on those fasting days. Which means, if you choose to fast on Tuesdays and Thursdays you can still have two small snacks that day that total 500 calories (600 for men). This involves doing a 24 hour fast once or twice a week, whichever one you can manage. You simply avoid eating for 24 hours straight. Basically means you fast every other day. You are allowed 500 calories during the fasting days. This involves fasting during the day and eating one large meal in the evening, even though this method allows you to eat raw fruits and vegetables during the day before that large meal in the evening. Try and skip a meal when possible. What Can You Drink While Intermittent Fasting? When fasting, drinking water is your best choice because water helps cleanse the body of toxins. You can also have other non calorie drinks such as green teas, herbal teas, black tea or coffee. Avoid artificially flavored or sweetened drinks. Sorry, but that includes diet sodas. Studies have shown that artificially sweetened drinks can stimulate your appetite. Stick with water, plain tea or black coffee as suggested above. Exercise if you can manage it. Be diligent about portion size. Avoid fatty, processed and sugary foods as much as possible. Fasting for 16 – 20 hours a day can help you safely lose 1-4 pounds of fat a week. Why is there such a gap in numbers? Well there are lots of factors that can help speed up your weight loss progress. Fasting alone will help you lose weight safely. But when you eat healthier meals, keep portion sizes moderate and add exercise to your daily routine in addition to the fasting, the pounds come off much faster. People with medical conditions should check with their doctor before taking part in any fasting program. "Why Intermittent Fasting Burns Fat Faster And For Good".